Good afternoon…it’s thick out there! 1PM temperatures are now 88° @ KCI and 91° in downtown KC. KCI, as of this writing at least, still has NOT hit 90° this year. Obviously that can and may change in the next couple of hours. Downtown has hit 90°+ 6 times (including today). Tonight: Warm and muggy with light winds. Lows 70-75°. Let’s pay attention to what happens across the Plains later this evening as some sort of thunderstorm cluster will develop in NE…what will need to be watched is whether or not some sort of outflow can be pushed south into N MO or NE KS later tonight. Summer starts officially at 5:51 AM Saturday morning but it really feels like summer out there now with plenty of heat and humidity. That combined with a stagnant airmass is creating sauna-like conditions out there this afternoon. I often talk about meteorological summer (whichever season) and astronomical summer (or whatever season). For record taking ease we have already started summer (6/1) and it runs till the last day of August. Astronomically speaking/thinking though (and more commonly thought of, aside from us weather nerds) tomorrow starts real summer. 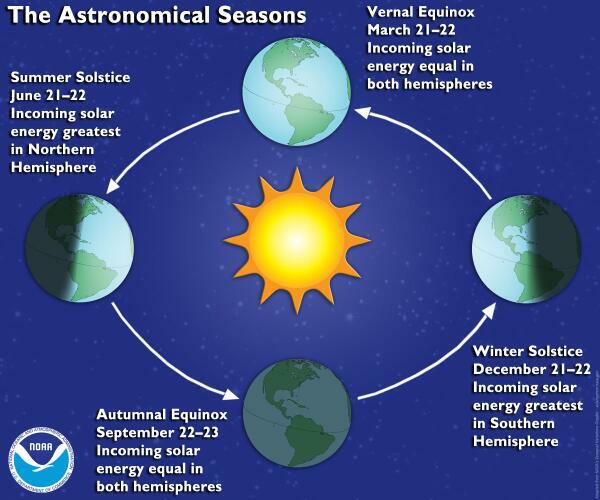 Here is a nice image from the folks at NOAA explaining the seasons and how solar energy is altered. So far meteorological summer has been rather hum-drum in terms of temperatures. We’ve finally tilted to above average levels for the month/season. As of yesterday we’re running about 2/10th’s of a degree above average for the month/season so far. There hasn’t been much change in the weather discussion from yesterday’s blog. So at this juncture I won’t re-write all that was written yesterday. Our weekend chances don’t look that great to me closer in to the KC area. While I can’t rule something out…it appears the chances really are under 20% on SAT and around 30%+ (and increasing through the day) on Sunday. The tricky part of the forecast for tomorrow through noon on Sunday is whether or not any weird boundaries/outflows from various small convective clusters will drift towards the area. Perhaps the better chances of that occurring is towards the IA border and out towards the east of the region. Later into Sunday afternoon/night and Monday the storm chances will definitely be increasing as a complex of storms moves through KS and tries to make a run on us. Then on Monday a cold front will move in and combined with all the juice in the atmosphere should create additional storminess through the region into Monday evening. The atmosphere will be again loaded with moisture from the ground upwards and the potential for torrential rainfall will also be on the increase as some may see 1-3″ of rain come down from this scenario. This future cold front will also help to usher in more comfortable and somewhat cooler air into the region for TUE/WED so the A/C’s which are working hard now will catch a small break for a couple of days/nights next week before things turn steamy again later next week. There are indications that we may head towards the last few days of June on a hotter trend as well. That’s it for today…have a great weekend and I’ll update the blog by 2PM Saturday. I’m always sad to lose the daylight time. Joe how many hrs/minutes of daylight do we have tomorrow? I know my brother in Seward Alaska today has 19 hrs 5 min from sunrise ( 4:34 a.m. this morn) to sunset (11:39 p.m.).